First, I know that I have had a serious shortage of blog posts in the last couple weeks. Sorry, all! Work got crazy busy, and to be truthful, I wasn’t cooking anything all that exciting – I was too tired! But now work has gone back to regular crazy so I’m back on my regular schedule. I have a couple of things on tap for this week, so look out! Third, pizza. Yes, again. I have not yet gotten tired of pizza! I think I’m more surprised at this than anyone. but I’m rolling with it. Truthfully, I may have gone a little pizza crazy this weekend. I almost hate to admit it, but here goes: I made pizzas three days in a row. Yep, you got that right – all weekend it was pizza, pizza, pizza! Friday, I made a Spinach and Artichoke Pizza (pictures and recipe coming later this week) for my sister, Laura, and my best friend, Kara. We hung out, ate pizza, drank wine – it was a lovely night. I also tried a dessert pizza with Strawberry Balsamic Black Pepper Jam, chocolate chunks and marshmallows. Not bad, but not as good as the Spinach and Artichoke main course. 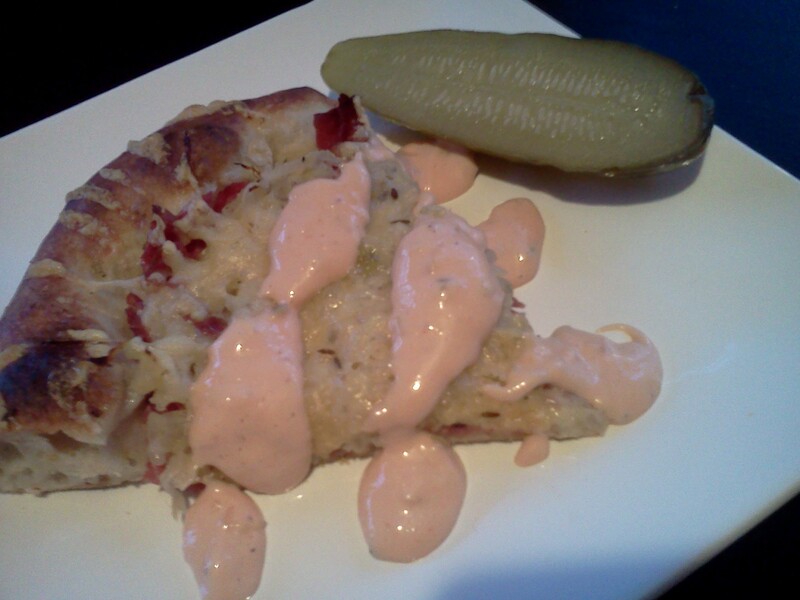 But this post is about my St. Patrick’s Day pizza – corned beef and sauerkraut. All the tasty ingredients of a Reuben sandwich – on a pizza. And it was good! Really good! I’m going to tell you a secret. I don’t like to talk about it, but St. Patrick’s Day is one holiday that I am not good at cooking for. There. I admitted it. Whew, that feels better! For the past several years on St. Patrick’s Day, I’ve made some kind of sauerkraut and pork crockpot dish in different variations. Inevitably, Brian isn’t all that thrilled about it and I end up with a bunch of leftovers that no one wants to eat. Not my finest moments. But not this year, my friends! This year, he ate three pieces of pizza – success!!! I’m a huge fan of cold toppings on hot pizza (See my California Chicken Pizza for one example, or try a hot pepperoni pizza with cold, crisp banana peppers if you don’t believe me…yum!) So for this Reuben Pizza, I decided to leave the Thousand Island Dressing off until the end for that hot/cold effect. This pizza was simple, but had big flavors. Deli sliced corned beef, sauerkraut, and good swiss cheese made up the bulk of this hearty pizza, which was then topped with good ol’ Thousand Island Dressing and served with a big @ss deli pickle. Awesome! Here’s the deal. This isn’t the prettiest picture I’ve ever taken. I need a squeeze bottle for decorating plates so I can feel like one of them thar’ fancy TV chefs. Brush the pizza dough with a small amount of garlic olive oil. (Yes, you could use regular olive oil, but if I can add garlic to just about anything, you better believe I will!) Top with corned beef, sauerkraut and swiss cheese. Sprinkle Caraway seeds over the top. They’re pretty and they add that bit of rye taste that you expect with a Reuben. Transfer to pizza stone and bake for 8-10 minutes. When the pizza is done, remove from oven and let cool until the cheese sets. Slice , top with the Thousand Island, serve and eat! I recommend alternating bites of pizza and pickle for the best balance of flavors. Did you spice up the traditional St. Patrick’s Day meal this year? What’s your opinion of the contrasting hot/cold ingredients on pizza? This entry was posted in General and tagged corned beef, homemade pizza, pizza, reuben, sauerkraut, St. Patrick's Day on March 18, 2013 by Melissa. I would love this … the rest of my family might freak out if I try to make them eat it. Guess that just means I don’t have to share! 🙂 We tried a thai chicken pizza a while ago that was really good. Sweet hot spicy–yum! Sometimes not sharing is okay! The bonus to not putting the dressing on until the end is that it did reheat well, which is nice. Thai chicken pizza sounds amazing! I love spicy food. This looks amazing!! This pizza should be served all year round, not just on St. Patrick’s Day! Inspired pizza–I don’t care if you don’t have a fancy drizzler (me, neither) your pizza sounds great just the way you did it! Thanks, Kirsten! My presentation is getting better, but sometimes I figure what the heck – if it tastes good, I’m happy! What’s not to like? 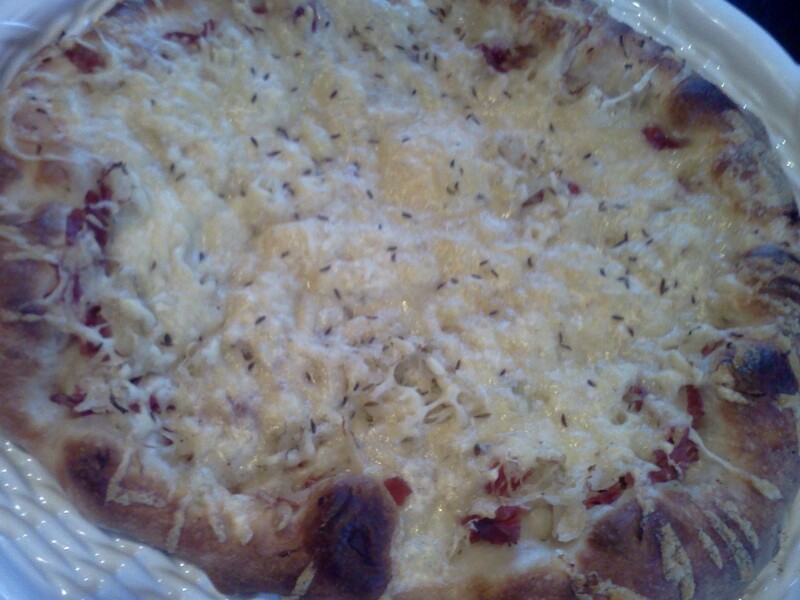 A rueben sandwich is my “go to” comfort food, so a rueben on a pizza sounds great! I absolutely love a hot pizza with one cold ingredient on top. I made a regular pizza in the summer and we got beautiful baby arugula from our CSA share. I dressed the arugula with a little olive oil, balsamic vinegar and a little salt and pepper and plopped that salad right on top of the pizza. Every bite was heavenly, and we overindulged a little. Since your Uncle Kim is laid up right now we didn’t get to eat his corned beef and cabbage like we usually do. Next year! He puts parsnips in and he makes a heavenly cold horseradish and whipping cream dressing for the corned beef. Oh my goodness it’s so good. Also, the hot and the cold! Arugula on a pizza sounds wonderful! Brian loves greens, so he would probably enjoy that – I’ll have to try it! Uncle Kim’s food is always amazing, so I’m sure that his corned beef and cabbage is no exception. Tell him I’m glad he’s home! I love you guys! I am hungry just looking at that pizza!! I love what you are doing with these recipes. I am sure it was delicious! I usually make corned beef and cabbage, but did not this year. I made a cabbage and white bean soup. The good part was the recipe said to broil a thick slice of whole wheat bread, rub it with a piece of garlic, put it in the bowl and put the soup on top of it,then top with fontina cheese. Pretty tasty! Thanks! That soups sounds great, although I’m pretty much a fan of any recipe that starts with a thick slice of bread and garlic. I’ll have to remember that next time I make a soup! Pizza crazy is never a bad thing, not when you’re making your own. Nice work! Your pictures are getting better too. It’s weird, but I actually photograph my food outside when there’s enough natural light. It’s really helped my photos. The things we do for blogging, eh.